When I first started to cook, I took an old cookbook from my mom called "A Taste of the Tropics" by Jay Solomon. We got this cookbook at a restaurant we ate at in Ithaca, NY in the late 80s and early 90s. The restaurant is no longer there and I'm pretty sure the cookbook is out of print, but it is a wonderful book which taught me a great deal about Caribbean, tropical and pacific rim cooking, as well as many wonderful ingredients used in cooking from this region. In addition, it is from this book that I learned what a chutney was, how great chutneys are with almost any food and how the possibilities for making a chutney with almost any fruit are endless. At any rate, some of my favorite recipes from this book are Jay's fish recipes. It's perfect. This dish is great when served with a nice homemade risotto, which is one of my husband's specialties. Another great recipe from this book, which Jay says originates from the pacific rim, is red snapper with pineapple-tamarind salsa. Tamarind is such an interesting thing to cook with - I absolutely love it. In fact - it's so tangy and delicious that it's great to just nibble on. I once had a wonderful drink at an Indian restaurant (Indian cooking also often uses tamarind) that was a tamarind cocktail that was amazing. The recipe below is unchanged from the recipe in Jay's book, "A Taste of the Tropics." To make the red snapper basically only requires making the tamarind-pineapple sauce, which is really no more than a chutney. First you must extract the substance from the tamarind. Tamarind can be bought in blocks, generally at an Indian market or specialty grocery store. First, take an 8 oz block of tamarind and combine with 1 1/23 cup water and simmer for 5-10 minutes, breaking apart the tamarind pulp. This will make a tamarind-juice which you will keep, and discard the remaining pulp. Cook for about 15 minutes over medium to medium-high heat until it thickens to the consistency of a chutney (very jam like). The add about 1 T of cilantro, or leave it out if you don't like cilantro. Now all you need to do is cook the red snapper and top the fish with the chutney and your trip to the pacific rim is complete. These recipes are great because they do remind me of trips I have taken to the Caribbean and to Hawaii and I love the tropical and exotic flavors. Perhaps they are not 100% authentic (one of the contributing bloggers grew up in Hawaii and may write about some traditional Hawaiian cuisine at some point) but I love them and they do transport me to a wonderful, tropical place. Which reminds me - I so need a vacation. For those readers who are concerned about sustainability, Chilean seabass may not be the best option as they are severely overfished and primarily caught using illegal methods that endanger other marine life. If mahi mahi are not available, some sustainable alternatives include sablefish (black cod) and striped bass. Also, the salsa can be made with mango if papaya is not available, although personally, I prefer with papaya. This is one of my favorite dishes of all time. 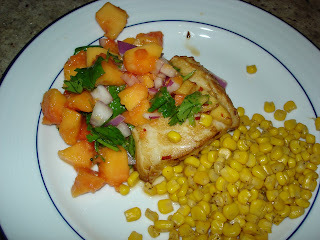 For those of you who like fish, try this recipe out, you will not be disappointed. Also, the marinade blends perfectly with risotto, kicking it up a notch as Emeril would say. If Chilean Seabass doesn't work for you, I think you might also try it with Halibut.